(ōrī`ən), in Greek mythology, Boeotian hunter. When Oenopion delayed giving his daughter Merope to him, Orion, when drunk, violated her. Oenopion then blinded him, but his vision was restored by the rays of the sun. The story of Orion's death has many versions. Some state he offended Artemis, who killed him. Others say that he became her favorite hunting companion, but offended Apollo, who loosed a giant scorpion to chase Orion into the sea. Apollo then tricked Artemis into shooting Orion. When she discovered what she had done, she gave way to her grief and immortalized her companion and the scorpion by placing them in the heavens as constellations. 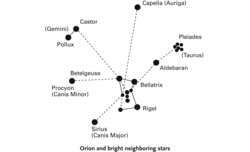 , bright star in the constellation Orion; Bayer designation α Orionis; 1992 position R.A. 5h54.8m, Dec. +7°24'. A red supergiant with a luminosity about 13,000 times that of the sun, it is of spectral class M2 Iab. , bright star in the constellation Orion; Bayer designation Gamma Orionis; 1992 position R.A. 5h24.7m, Dec. +6°21'. A bluish-white giant of spectral class B2 III, its apparent magnitude of 1.63 makes it one of the 25 brightest stars in the sky. ..... Click the link for more information. (Beta Orionis) at his left foot are all among the 25 brightest stars in the sky, while Saiph (Kappa Orionis) at the right foot is of second magnitude. Three bright second-magnitude stars form a belt almost along the celestial equator; hanging from the belt is a sword of dimmer stars and including the famous Great Nebula (M42). Orion reaches its highest point in the evening sky in late January. (or-ÿ -ŏn, oh-rÿ ) A very conspicuous constellation on the celestial equator, close to the Milky Way, that is visible as a whole from most parts of the world and can be used to indicate the positions of many bright neighboring stars (see illustration). Five stars are of 1st magnitude or brighter; 15 are brighter than 4th magnitude. Rigel (β), Betelgeuse (α), Bellatrix (γ), and 2nd-magnitude Saiph (κ) form the distinctive quadrilateral outline inside which are the three remote 1st- and 2nd-magnitude stars of Orion's Belt, Alnilam (∊), Alnitak (ζ), and Mintaka (δ). South of the Belt is Orion's Sword, in which lies the naked-eye gaseous Orion nebula. The area contains many double stars including Rigel, several variable stars, and the dark Horsehead nebula. An immense oval ring of ionized hydrogen, Barnard's loop, surrounds most of Orion. Abbrev. : Ori; genitive form: Orionis; approx. position: RA 5.5h, dec 0°; area: 594 sq deg. an equatorial constellation, the brightest stars of which have visual stellar magnitudes of 0.1 (Rigel), 0.3–1.2 (Betelgeuse), 1.6 (Bellatrix), 1.7, 1.8, 2.0, and 2.2. The Orion nebula, which is visible to the naked eye, is found in the constellation. The constellation has many hot stars of the early spectral types O and B; these stars form a stellar association. The best conditions for observing Orion are in the months from November to January. Orion is visible from all parts of the USSR. in ancient Greek mythology, a giant hunter of Boeotia. According to one version of the myth, the goddess of dawn, Eos, loved Orion, and Artemis, in compliance with the will of the angered gods, slew him with an arrow. Thereupon, Orion was turned into a constellation. According to another version of the myth, Orion was turned into a constellation by Zeus for having importuned the Pleiades with his love for several years. A northern constellation near the celestial equator, right ascension 5 hours, declination 5° north. Also known as Warrior.